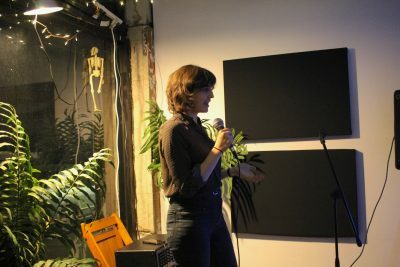 On November 8, the Philadelphia Tenants Union (PTU) hosted “Stand Up (to Landlords).” The night of comedy and storytelling, held at the Philly Socialists office in Kensington, had a two-fold purpose. The first was to help raise funds for Ricci. An organizer with the PTU, Ricci has been fighting City Point Property Management and her former landlord, Thomas Flack, since she was wrongfully evicted. The funds raised at the “Stand Up” event went to Ricci and her family to help her in her fight. The second purpose of the event was to spend time in solidarity with others against abuses by landlords. Six people went onstage during the evening, each sharing a different series of stories about their experiences with one or many landlords. A few folks shared hilarious stories, including one in which the tenant and her housemates were subjected to boiling hot water in their toilet and a raccoon infestation in the attic. Others shared stories of frustration, such as one woman who was given an eviction notice, only to move out and learn she had to pay the remainder of her lease. Another asked the audience to consider what it means when your landlord is the Department of Corrections, and the worst things you have to suffer aren’t broken pipes but the cruelty of the State. There was one triumphant tale shared though: One woman described how, after a series of complaints to her landlord, she took him to court for multiple inspection violations; ultimately through her perseverance, she won. And perhaps that was the larger theme of the night. Yes, fighting landlords on a daily basis or in a courtroom can be hard and disheartening. However, being together and sharing stories can bring a deep sense of comradery, catharsis, and a reminder that we are not alone in this fight. Together, we may find peace, joy, laughter, and solidarity in the struggle.